A local artist has ditched the 9-to-5 to make a hobby his life’s work. As he was growing up in the Northern Virginia sprawl of Great Falls, Brian Korte was not the typical kid out playing sports with his peers or glued to a Nintendo screen. “When I was 8, 9, 10 years old, my brothers, my whole family basically, they would spend their Sundays downstairs watching football and I was upstairs doing my own thing, just playing with Legos,” Korte said. One of those pathways led Korte to choosing a unique way of making a living – painstakingly putting Lego bricks together to create mosaic portraits. Brickworkz LLC was launched in January 2006, and its reputation for creativity and fine art has spread from Richmond to all parts of the world. Korte’s first international client was in Israel, and he’s done work for companies in Australia, Ireland, Hong Kong, Denmark, Canada, Guatemala and the United Kingdom. Most recently, he was given a rush order for portraits of the twin sons of the Crown Prince of Bahrain, when they turned 3 last summer. After graduating from Radford University in 2000, Korte moved to Richmond and started a consulting business focused on information technology, marketing and design. But he wasn’t satisfied. He embarked on an 18-month, cross-country trek that took him through all 48 contiguous states. It also helped Korte, 38, decide what he wanted to do with the rest of his life. That first portrait, of Jeff and Olivia Pollard, was created in 2004, but it wasn’t until two years later that Korte actually started Brickworkz LLC. That gallery showing enabled Korte to let the Richmond area see what he could accomplish, and it wasn’t long before his work was in demand around the country and the world. In 2007, Korte was commissioned to design a Guinness World Record-breaking Lego mosaic, dubbed the “Largest Lego image” in the world. The piece was more than 44 feet long and 22 feet high, containing more than 1.2 million Lego parts. 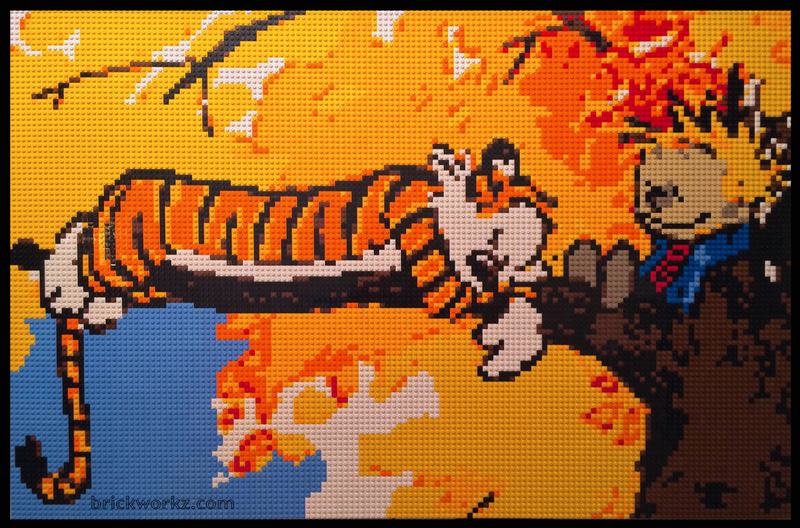 Brickworkz designs Lego art for individual families, as well as companies. The firm leads Lego-themed team-building events for businesses. Working off photographs, Korte will commemorate babies, wedding anniversaries, bar mitzvahs, Christmas presents – almost anything at all. One of Brickworkz’s biggest fans is the wife of major-league pitcher Jason Hammel, Elissa. She has commissioned Korte for a number of projects, including Jason’s first major-league homer, his one-hitter with Baltimore and mosaics of their two children. While Korte isn’t affiliated with the Lego company and isn’t endorsed by them, all of the materials are obtained from Lego, or from third parties who collect the tiny plastic bricks and sell them when they aren’t available from Lego any more. Korte has help putting some of the larger projects together, or when there is a rush job. It takes a lot of patience by all parties. In this mosaic process, however, Korte creates the design on a computer, and there are no surprises. The design is then constructed over Lego base plates, with thousands of tiny-tiled Lego squares being filled in one-by-one. Once the mosaic is completed, it’s mounted onto a frame that can easily be hung in homes or offices. “It’s the doing of the mosaic, the making of the mosaic, is what I enjoy the most,” he said. Korte has been working out of his home in Midlothian in recent years, but the volume of work has increased to the point where he needs a bigger space and some full-time assistants, so Brickworkz is moving into separate quarters in 2016. “My wife, Molly, is going to be very happy to get the rest of our house back,” laughed Korte. Several of Korte’s works will be on display until March 13 at the Cultural Arts Center at Glen Allen in Henrico County. “It’s what every boy dreams of doing,” he said, “but it’s also very much a business. I get to work with my hands. I get to work with wood. I get to work with computer design. For more, visit Korte’s website or call (785) LEGO-ART. John Packett, a freelance writer, is a retired sports writer. He worked for the Richmond Times-Dispatch for nearly 39 years, covering everything from Super Bowls to U.S. Open tennis tournaments to the Richmond Renegades championship hockey season.